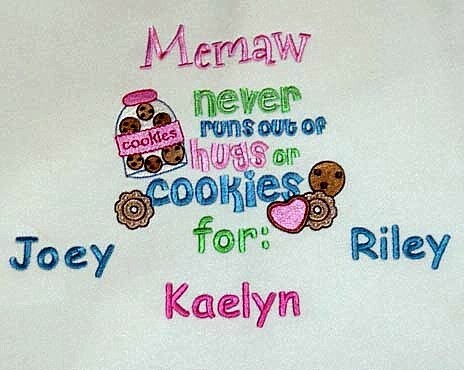 I will machine embroider this cute design on a front chest of a new Gildan brand 50/50 heavyweight sweatshirt. All sizes are unisex. The design as shown measures 10"Wx71/2"H. This will vary accoding to how many names you will need. Also the placement of the names will vary and may have some directly next to the design. The max. number of names is 12. The price includes up to 4 names and each additional name is $1.50. For the title I can change the Memaw to several different names. This is the list of names: Memaw, Granny, Nana, Nan, Nannas, Meme, Mimi, Grandma, Grand and you can add Great to these also. All of these names will be done in the shown font. If you need any other name I will need to use one of my fonts (same as the kid's names). If you need the names in a particular order, please type that in the "Special Instructions" area of the order form.